Cycling Weekly: When did you start building frames? DP: 1975. I had moved to Verona for school reasons – I was studying to be a teacher. This was the official reason. The real reason was that I fell in love with [and married] a young girl whose father was a framebuilder. My father-in-law was the nicest person I’ve met in my whole life. He was a great man. He passed away in the Nineties. He is probably the man who has had the most influence on me. Not only in terms of frames, in terms of life. His name was Luigi Milani but everybody called him Luigino – little Luigi. The basics, everything that I’ve learnt was from him. How long did you work for Luigi Milani? DP: From 1975 to 1991. In 1991 I opened my first shop. I was working as a contractor. Who were you building frames for? DP: That’s a secret. There is a box full of paper out there in the factory if you want to look. I don’t like to talk about the past. Everybody says Dario built a frame for this or that guy. I don’t think it is very important. I used to receive a piece of paper with the specific sizes and that was it. In the 1970s there were a lot of framebuilders around Verona. I think probably 50 per cent of the frames [made for pros] came from Veneto. 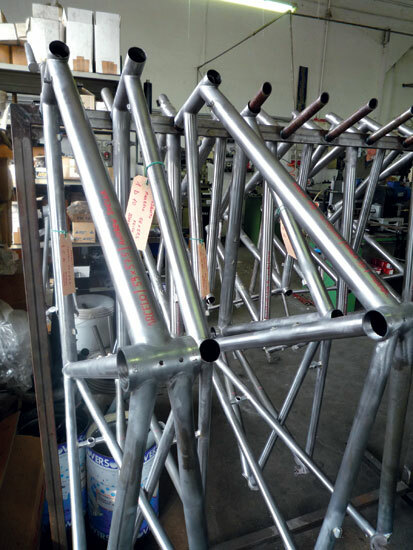 Billato, Sarto, the guys in Treviso, Simonato, Cassin… My father-in-law said it is not difficult to build a great frame, but it is a little bit more difficult to build 10 great frames. When I was with him we built 6,000 a year. What happened when carbon arrived? So carbon has made no difference to you? DP: There are some very interesting carbon frames, but in my opinion 90 per cent of companies use the carbon badly. I have nothing against carbon-fibre. It is very interesting but not for me because I am too old. I say it is not important which material you use to build a frame; it is the use of the material. That is completely different. The general consensus is that aluminium is harsh, steel is smooth and carbon-fibre is the perfect balance – it’s not true. It’s about the choices you make during the building process. 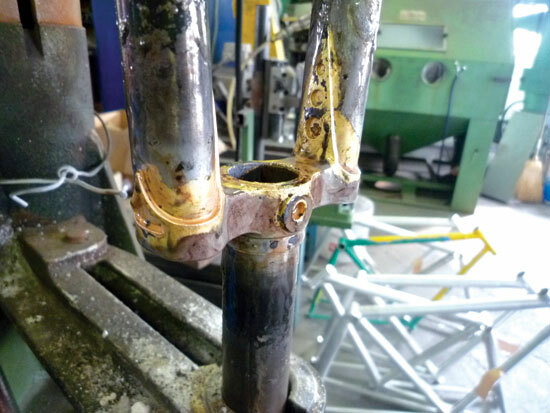 You can build a really good frame out of aluminium but a really bad frame out of steel. So aluminium is not finished as a material for top-end bikes? DP: In my opinion, no. 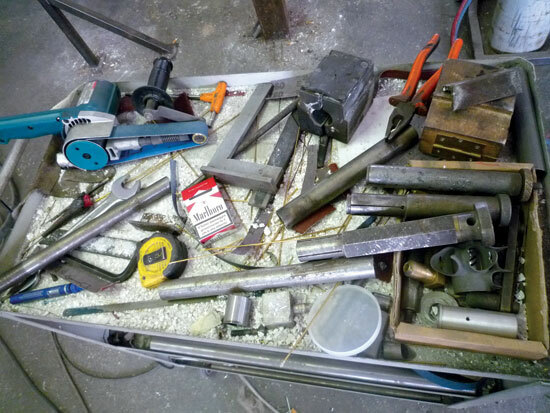 I build 20 per cent of my frames in aluminium. It’s not popular at this moment but it’s not a bad material. Bamboo is a bad material. That’s only my opinion. But it really depends on the point of view from which you’re looking at the bicycle. I am looking at it just for racing because I was born with racing. For a city bike bamboo is not too bad. What are the most important qualities of a frame? DP: You can have a good or a bad feeling. You don’t need a long time to understand a bike. When you ride the bike the first time you hear something – the bike speaks to you. It says ‘I feel good, I feel bad’ depending on the choices of the builder. The power transfer is very important. Are your frames stiffer than they were in the 1990s? DP: Yes, but not all of them. My range goes from the Duende to the Big Leg Emma. The Duende is not stiff – it is a good balance. Can you see a time when the top professional teams will ride steel bikes again? DP: It’s difficult. The difficulty is that the companies need a large quantity of bikes to sell. The only country where it’s possible to build enough at a good price is probably China. And in my opinion it’s difficult to quality control a company that builds 30,000. Do you regret that carbon arrived and the bikes are made in China and the pros ride them? DP: The pros have changed in the last 10 years. They used to be more interested in the bikes, quality, geometry. Cervélo and Trek spend a lot of money to push a bike onto the market. It’s not possible for the team to use another frame – there’s no sense because the customer wouldn’t understand if it was a different frame [from the one the pros ride]. 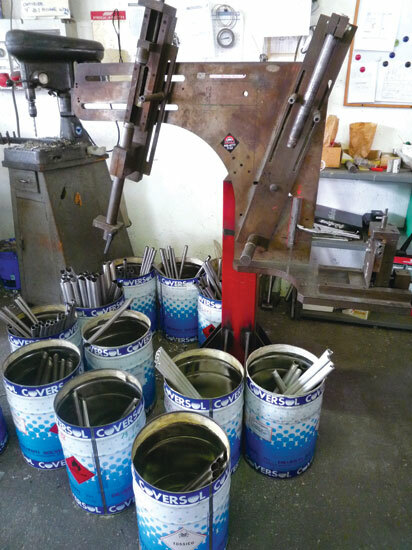 Seventy or 80 per cent of people fit a stock frame, so it’s the same for the pros. Twenty per cent of them don’t fit a stock frame, but they have to use them. They have no choice. Which framebuilders do you most respect at the moment? DP: A lot of them. The young guys are building beautiful frames. For example Dan Polito, Engin Cycles, Vanilla Workshop, Crisp, but these are Americans not Italians. I think there are over 100 companies in the USA that are building good frames. DP: Because I think people are a little bit tired of finding only carbon frames and they need something different. Something that acknowledges the past but still has performance.